This basic beef stroganoff recipe is truly an easy dinner recipe. So elegant it’s great for company, but so quick to prepare it is a wonderful weeknight meal too. You will see that this really is a quick and easy dinner recipe. Quickly fry steak strips in saute pan over medium high heat until lightly cooked. Remove from pan and cover with foil to keep warm. Lower heat to medium and cook onion in butter until soft. Add sliced mushrooms and brown them. Return meat to the pan and add salt, pepper, wine, sour cream and nutmeg. Simmer for 5 minutes. 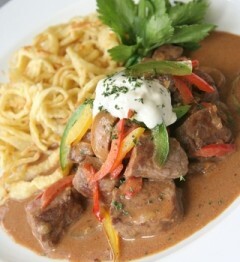 The addition of wine is optional but it is what makes this an authentic beef stroganoff recipe. You can replace it with an equal amount of beef stock if you prefer. Beef stroganoff is traditionally served over noodles, but it is equally good served over rice, mashed potatoes or spaetzle. For a more modern and even healthier twist, serve the stroganoff over cooked quinoa or farro. The beef for this recipe is usually pounded thin, but if you want, just slice it into very thin strips. Add thinly sliced strips of red, orange and yellow peppers for color and added flavor. Just saute the sliced steak, add a few other simple ingredients and you are done in under 30 minutes from start to finish. Being that it is a 30 minute meal, it is important to get steak that will be tender when it is cooked quickly. For that reason beef that needs to be marinated may not work out as well in this recipe. It is perfect for the slow cook versions though. If you like our beef stroganoff recipe, have a look at our other beef, pork and chicken recipes here.